In my early twenties I was a shopaholic. I made too much money and spent it without thinking. In my late twenties I was broke following the rock ‘n’ roll dream and a big night out for Hubby and I was being able to go out for french fries. During this period of my life I left the shopaholic behind and for the first time in my life learned to live frugally. Now that I am forty and no longer broke I spend money on odd things. I am fine wearing the same clothes that I have worn for the past ten years and will buy shoes when I absolutely need to, but tell me about a food ingredient that I have never used and I will find it and buy it. This behavior is what prompted operation Clean Out the Cupboards! While trying to figure out what I was going to make next I came across some unopened items that I completely forgot about, like: chia seeds, succanat, brown rice flour, and tapioca flour. The flours reminded me of how determined I was during Vegan MOFO to figure out how to bake gluten-free. It inspired me. I also realized I had lots of quinoa so I started to search the internet to see if anyone had baked sweets with it before. Yep, it had been done many times and in many ways. After reading quite a few I grabbed bits and pieces and came up with the recipe I am about to share. I am not a gluten-free baked good fan, but these were pretty tasty. I brought them to my gluten-free friend who said they are now her favorite cookie. Plus if you use the same ingredients they aren’t as bad for you as a cookie normally is! *If you don’t have chia seeds you may use your favorite egg replacer for two eggs. *You can use your favorite gluten-free flour or if you aren’t gluten-free use the flour of your choice and take out the xanthan gum. *Succanat may be replaced with brown sugar. In a cup mix chia seeds and 6 tbsp water and set aside. It needs to sit for at least 15 minutes to thicken. In a large frying pan (that has a lid) over medium low heat melt 1 tbsp coconut oil. Add quinoa, cinnamon and maple syrup. Saute for 5 minutes. add 1 cup water, raise heat and bring to a boil. Once boiling reduce to a simmer, cover and cook for 10 -15 minutes until water is gone and out shell of quinoa begins to separate. In a large mixing bowl combine flours, xanthan gum, cocoa and succanat. Set aside. Once quinoa is done remove from heat and cool for a bit. In a small sauce pan melt 2 tbsp coconut oil and peanut butter. Pour quinoa, chia seeds, and coconut oil mixture in to dry ingredients. Stir until well mixed. 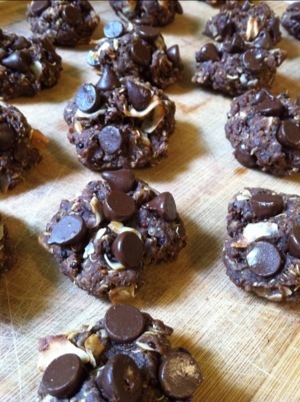 Add in coconut and 1/2 cup chocolate chips. Measure 1 tbsp of dough at a time and place on cookie sheet. Place chocolate chips on top of each one. Make sure to push them in or they will fall off after baking. Bake for 20 minutes. Move to a cooling rack. Enjoy hot or cold. Especially good with coconut milk! Gallery | This entry was posted in dessert, Gluten Free. Bookmark the permalink. These were delicious a day later after being stored in the refrigerator. These were delicious after being stored in the refrigerator for a day. Yum! Glad you enjoyed them! Were they okay the 1st day? looks great! how many servings does this make? I can’t believe I forgot to add that. I am pretty sure it made 24 cookies. Thanks! The friend I made them for said they are her new favorite cookie! if you are GF but not vegan, can you replace the chia seeds with eggs, and how many? Whole eggs or just egg whites or yolks? I would recommend trying them without eggs. The recipe wasn’t made with them in mind. Can you leave out the Xanthan gum ? I never tried it but I bet you could.